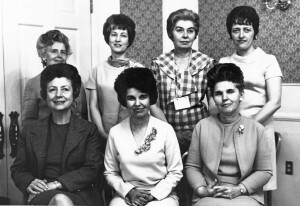 In 1967, Montana’s AAUW formed its own Status of Women Committee. That same year, the Billings branch organized a unique Inter-club Committee on the Status of Women that included two members from each of the participating groups: AAUW, Soroptimists, Altrusa, Zonta, and the Business and Professional Women. Its goals were to get more women into local, county, and statewide appointed offices; to encourage women to stand for state elective office; and to keep women in office as state superintendent of schools. AAUW Division Status of Women Chairperson Natalie Cannon was also a board member of the ERA Ratification Council (later the Montana Equal Rights Council) and a founding member of Montana Common Cause. She traveled across Montana to promote the Equal Rights Amendment. Photo by Phyllis Clark, Daily Interlake, November 15, 1973, p. 7. The inter-club committee adopted a strategy of solidarity: they committed to being nonpartisan, providing constructive support to women candidates, and not voicing opposition to any woman nominee chosen by members. Within a year, one of the coalition’s nominees was appointed to the Montana Selective Service Board (the first woman ever in this position) and another to the State Milk Control Board. “By pooling our efforts we could exert more influence on the appointing administrators than if we, or our clubs, had attempted this individually,” reported the Billings AAUW president. Following Billings’s lead, Helena women from AAUW, Zonta, League of Women Voters, Soroptimists, and the Helena Graduate Home Economists joined forces to create the Capital City Status of Women Committee. The Status of Women committees nominated qualified AAUW women to fill Montana’s many appointed public positions, and AAUW members wrote letters supporting women candidates. AAUW branches also sent observers to local government and school board meetings, educated both men and women on the need for having qualified women in public office, and created local leadership development programs for women. 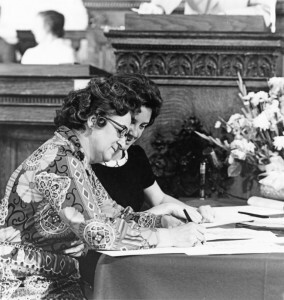 Several prominent AAUW leaders gained appointments to state offices during the 1960s and 1970s, including Bozeman’s Geraldine Fenn to the Montana Council on Human Resources, Billings’s Doris Davies to the Montana Library Commission, and Helena’s Harriett Meloy to the Board of Public Education. Women in state-level appointments gained valuable experience that often opened doors to higher positions. 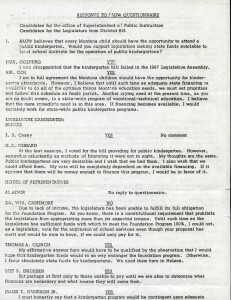 Fenn later represented Montana and AAUW at the White House Conference on Children; Meloy served eight years on the National Committee for Support of Public Schools. To combat inadequate representation and to familiarize women with legislative processes, in 1965 AAUW began sponsoring a “Legislative Day” during each session. 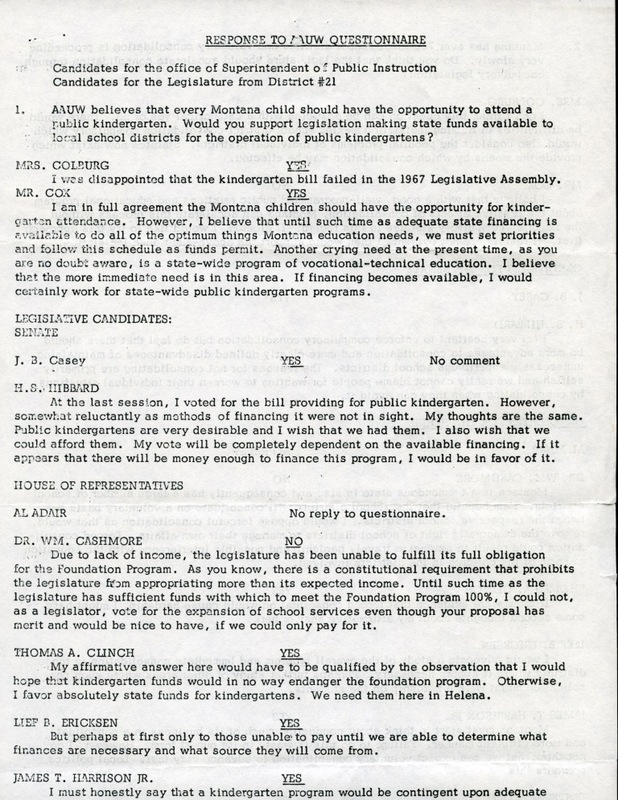 This groundwork produced many legislative triumphs in the late 1960s and 1970s. The Missoula branch earned one of AAUW’s earliest policy victories with the passage of a bill requiring day-care licensure. Anaconda AAUW conducted a statewide survey of mental health needs and presented the findings as recommendations to the state legislature. Billings and Helena branches led a well-organized, seven-year campaign to create state-funded, public kindergartens. AAUW members Louise Cross of Glendive and Harriet Meloy of Helena organized tours of strip mines in eastern Montana and helped create reclamation regulations. The Governor’s Commission on the Status of Women, chaired by AAUW’s Maxine Johnson, introduced family planning and pro-choice legislation drafted by the Helena, Miles City, and Bozeman branches. AAUW members’ lobbying efforts contributed significantly to the passage of these key pieces of legislation. 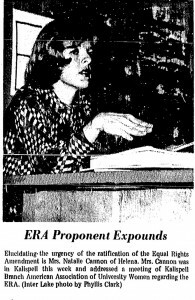 Another of AAUW’s priorities in the early 1970s was to ensure that women were included in Montana’s 1971-1972 Constitutional Convention. Three AAUW members became delegates to the “Con-Con”: Mae Nan Robinson (Missoula), Lynn Sparks (Butte), and Louise Cross (Glendive). 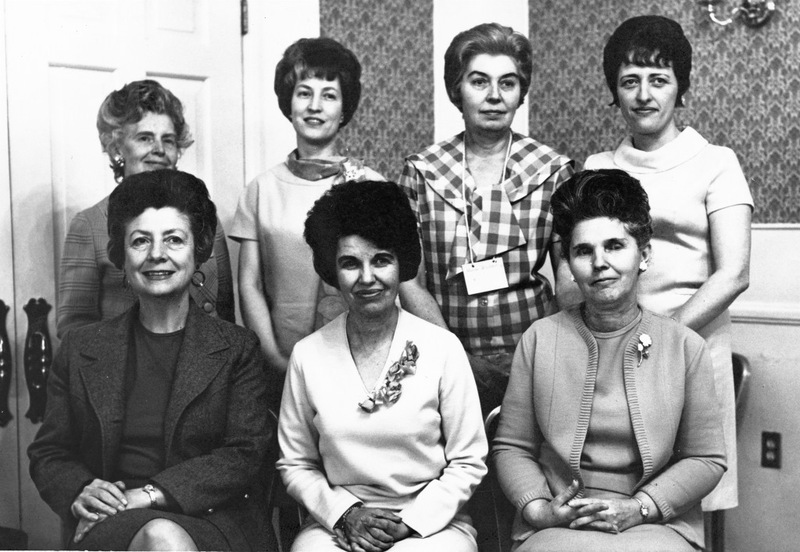 The AAUW delegates ensured that the 1972 constitution included Montanans’ “right to a clean and healthful environment,” equal rights language, and the mandate to teach about Montana’s Indian tribes in public schools. Read more about the political causes important to the AAUW in blog posts such as Defining Gender Equality: The Debate over the Equal Rights Amendment in Montana. Learn more about two passionate AAUW members in The Lifelong Quest of Frieda Fligelman and Belle Fligelman Winestine. AAUW Montana Division. Montana Treasure Stater 63, no. 4 (Spring 2012). Accessed November 7, 2014. AAUW Montana. Accessed November 4, 2014. AAUW Vertical Files. Montana Historical Society Research Center, Helena. American Association of University Women (AAUW) Montana Division Records. MC 202, Montana Historical Society Research Center, Helena. Davies, Doris. A History of the Montana AAUW, 1926-1994. Billings: American Association of University Women, 1994. Governor’s Commission on Status of Women. Montana Women: Their Future Role; A Report and Recommendations Presented to the Honorable Tim Babcock, Governor, State of Montana. 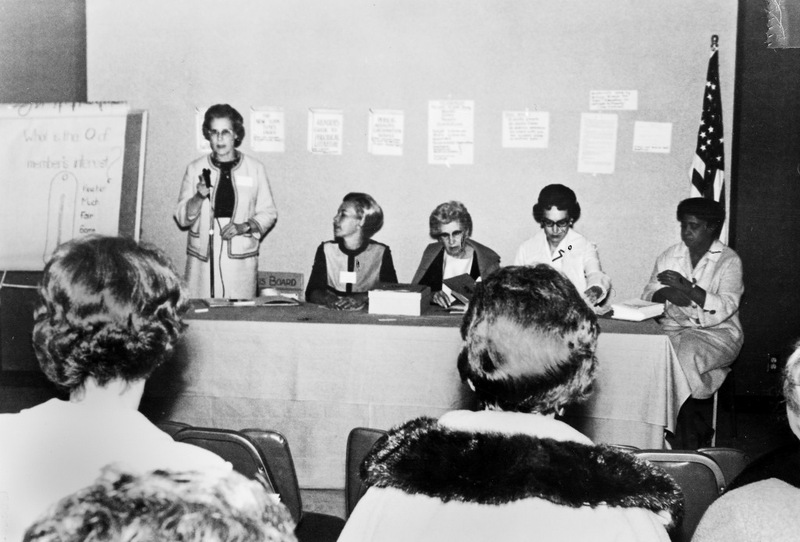 Helena: Governor’s Commission on Status of Women, 1967. Gronfein, Norma. Interview by Mary Murphy, October 9, 1987. Women as Community Builders Oral History Collection, OH 1038. Montana Historical Society Research Center, Helena. Harriett Meloy. Vertical files, Montana Historical Society Research Center, Helena. Johnson, Maxine. Interview by Diane Sands, September 17, 2001. Montana Feminist History Project, OH 378-45, Archives and Special Collections, Maureen and Mike Mansfield Library, University of Montana, Missoula. MacDonnell, Katherine. Interview by Diane Sands, June 9, 1987. Women as Community Builders Oral History Project, OH 1012, Montana Historical Society Research Center, Helena. Meloy, Harriett. Interview by Laurie Mercier, September 15, 1987. Women as Community Builders, Oral History Project, OH 1036, Montana Historical Society Research Center, Helena. Schaffer, Deborah. Feats and Faces: Chronicles of 26 Billings Women, with Photographs. Billings: American Association of University Women, 1994.